The Draper Utah Temple is the 129th temple of The Church of Jesus Christ of Latter-day Saints (LDS Church). It was dedicated in sessions from March 20–22, 2009. Prior to the dedication, the temple was open to the public from January 15, 2009 through March 14, 2009. 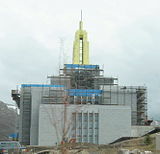 The intent to construct the temple was announced by church president Gordon B. Hinckley during the opening session of the October 2004 general conference. Hinckley said the new building was needed to relieve overcrowding in other temples in the valley. The temple is the fourth temple in the Salt Lake Valley in addition to the Salt Lake, Jordan River, and Oquirrh Mountain temples. The Draper Utah Temple sits on 12 acres (49,000 m2) at 2000 East and 14000 South in Draper, Utah. 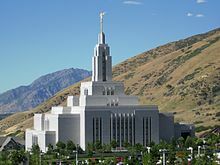 The 57,000-square-foot (5,300 m2) temple is 166 feet (51 m) high from the main level to the top of the structure's spire, which includes the Angel Moroni statue that sits atop most LDS temples. The location near the mouth of Draper's Corner Canyon includes an LDS meetinghouse. The temple towers over 1,000 acres (400 ha; 1.6 sq mi) of pristine open space in the canyon below that the city approved in fall of 2005. Many varieties of trees surround the temple and line the 492 parking spots. The groundbreaking for the temple occurred during an invitation only ceremony at the site which was broadcast on the church's satellite system to nearby stake centers. The ceremony was conducted by Russell M. Nelson of the church's Quorum of the Twelve Apostles, with all members of the First Presidency in attendance. The church announced on November 29, 2008, that the temple would be open to the public for tours beginning January 15, 2009. Reservations for tours were available until March 14, 2009. ^ Nielson-Stowell, Amelia (August 4, 2006). "Groundbreaking Saturday". Deseret Morning News. Retrieved October 16, 2012.